I normally don’t have incredible luck pulling variants, but I did with this one. 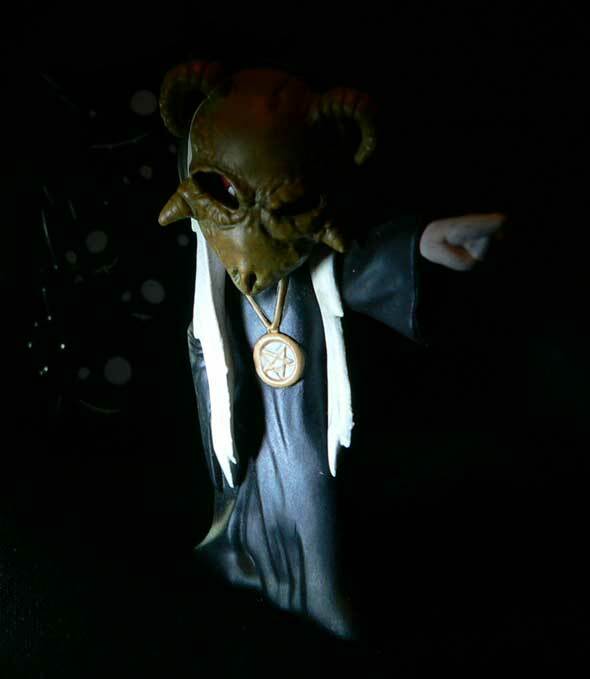 I thought Schitzo the Clown was cool enough to warrant buying some more of these creepy little figures, I went back to the well and pulled the rarest of the case assortment with this variant of Walpurgis. Apparently, this occult witch comes in three variants. Two are shown on the box. Both of them are unmasked. One has a black robe and one has a red robe. 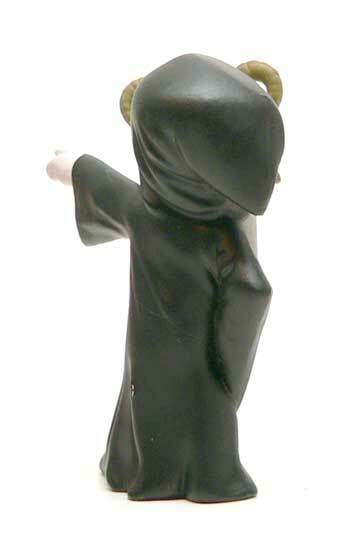 There is another version on the box that has been blacked out and is the rarest of the bunch, the masked Walpurgis. Now I had never heard of Walpurgis, so I looked it upon in my Encyclopedia Britanica. No, I used Wikipedia. Apparently, Walpurgis is a Spring festival named after a saint. The German version involves meeting witches and sorcerers. You can read more here, but the main thing is it’s exactly 6 months before Halloween. I watch a fair amount of scary movies. Most don’t bother be, but the occult stuff does. 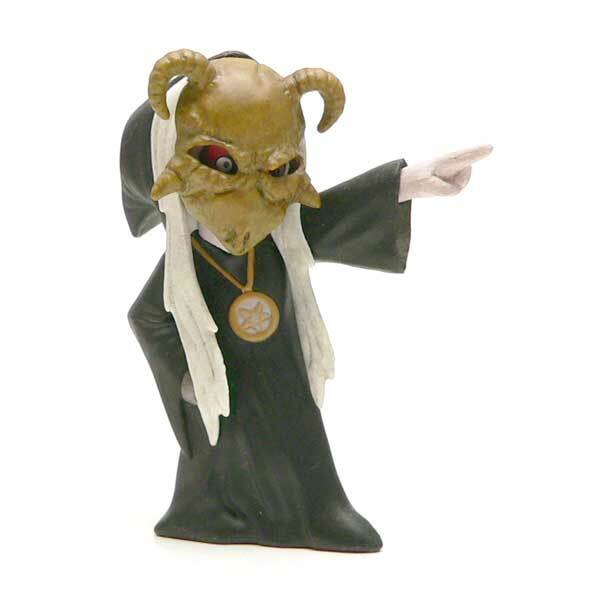 I have no idea why, and this figure oozes occult. The first notable thing is the pendant with the star on it. Apparently, witches take their style cue from Flavor Flav. The paint is well done here, though. Clean and no slop, which is impressive for this type of figure and scale. The second thing that stands out is of course the mask. Some kind of horned creature skull thing. It’s painted in bronzy tone and looks pretty good. Reminds of something out of the castle in Resident Evil 4. Now the kicker isn’t the mask itself. It’s what’s behind it. It isn’t removable, or at least doesn’t seem to be. But through the eye holes, you can see her red eyes. The depth effect adds quite a bit of realism to the piece. The body is pretty plain. It’s a simple robed figure. The folds are done nicely and it’s ever so slightly more dynamic than the clown body. Of course, the pointing at her chosen target for her summoned demons probably helps with that as well. She does come with an accessory, and it’s a pretty cool one. 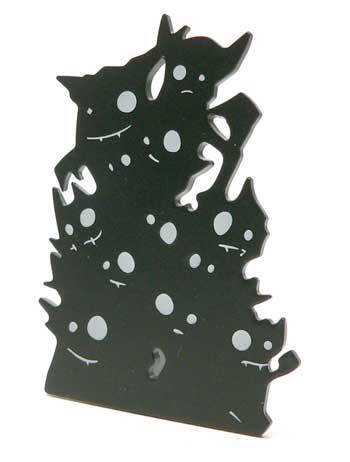 It’s designed like a card board standee, but it’s a number of shadowy demons and creatures all waiting to do Walpurgis’s bidding. There’s not really any detail to them other than the eyes and mouths, and they are done with paint on the smooth surface. I really dig it because it’s so no defined. Really cool piece. If we’d have had Goth kids at our school, I probably would have hung out with them. I kind of dig the just not quite right, creepy feel of this line. 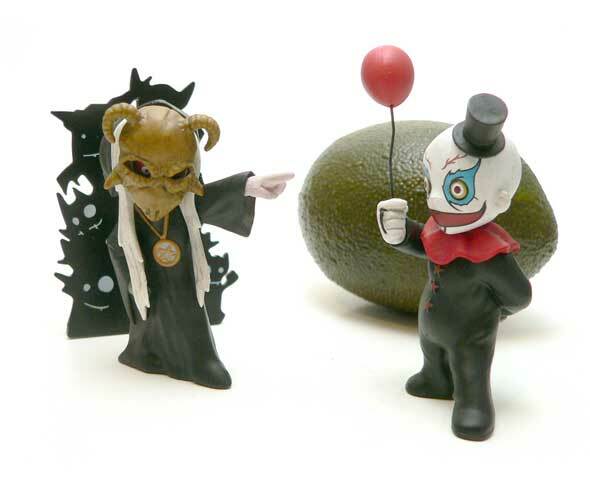 The mix of cute and horrific is perfect for a collectible. Not so cute it’s smile inducing. Not so horrific, you can’t put it on display. I have to head it to the Mezco folks they really seem to have the recipe right, and Walpurgis is great example of that. The accessory though really adds to the visual oomph of the figure and takes it up a notch over similar figures. This one looks really cool. Love the look of her eyes through the mask. Great review!